Forces have aligned to make this an auspicious year for accomplishing resolutions! Here’s greeting the Year of the Ox with Kung Hei Fat Choy, which means good luck, prosperity and longevity. The Year of the Ox, begins Monday, January 26, 2009 and signifies a time to sweep away old habits and start anew. 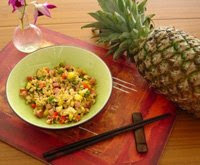 What better way than to jumpstart the process with a healthy, easy and delicious Pineapple Fried Rice using my simple stir fry technique. Some of my fondest childhood memories of growing up in Hong Kong include the rituals, ceremonies and foods during Chinese New Year’s two week celebrations. Many traditional dishes are served because they symbolize good luck like uncut noodles represent long life, dumplings represent good luck packaged inside, and fried rice signifies prosperity. In Asia, fried rice is either an elegant banquet dish or a homestyle staple which uses leftovers. Fried rice is an all-time favorite Chinese dish in America and the most requested dish I get asked in my Wok Star Cooking Class. Even picky eaters and kids love it because it’s a one-dish wok meal combining tasty flavors, different textures and rainbow colors. I realize it takes more than willpower to fulfill resolutions so to help make it happen, I’ve also got a video for Pineapple Fried Rice (a joint video project with Del Monte Fresh). In this video, you’ll discover the simple secrets to achieving perfect fried rice. The most common complaints I hear are, “sticky” rice and “soupy” veggies, so it’s important to use the right wok and technique to guarantee success. And that’s why I put together a Wok Star Kit to demystify the art of stir frying with all the essentials to help you succeed. Create your own variations by substituting ingredients. That’s what being a Wok Star is all about! First, fry vegetables…Heat wok till you see a wisp of smoke (for cast iron woks only.) Add 1 tbsp. of oil, then add half of the diced garlic and ginger. Add vegetables and pineapple, stir fry quickly. Add scallions at the very end so they don’t overcook. Remove ingredients and put them on a serving platter. Next, fry eggs…Heat wok till hot, add 1/2 tbsp. oil, add the eggs and scramble, keeping the eggs soft (use low heat so they don’t overcook). Set aside with veggies. If wok has eggs stuck to it, wash out and dry. Then fry rice and ham…Heat wok till hot, add 1 tbsp. oil, add garlic and ginger, then add rice and ham. Warm thoroughly. Add vegetables, then sauce, and combine thoroughly by stir frying. Last, add eggs and break up as you mix but don’t overcook them. They should remain soft and fluffy. This new year, instead of being a spectator watching chefs cook on television or being a passive diner, my mantra is ANYONE can be a Wok Star and make healthy, tasty, sizzling, wok creations right in your own home! Wok Stars agree my Kit is the solution to achieving their resolutions for longevity, prosperity and good luck. You can find out more about Year of the Ox, predictions and horoscopes, celebrities and compatibility. For a lot more about Chinese New Year traditions on what to eat, wear and how to decorate your home. You can also subscribe in right sidebar to my FREE newsletter focusing on meal ideas, resources, tips and techniques and where to eat good Asian food and beyond. One Response to How to Make Perfect Fried Rice!